Previous Albums: This is their 14th album. See article for the rest of the albums. There are very few bands out there that you can say started out one way, evolved into something completely different, and then came back to their roots. At least not the way England’s Paradise Lost has done it. They have come damn near full circle with their latest release, The Plague Within, which we’ll talk more as I build up to it. In the late 90s, they formed Paradise Lost…what is now considered one of the pioneers of gothic metal. Their first four albums, Lost Paradise (1990), Gothic (1991), Shades of God (1992), and Icon (1993), were heavily gothic/doom albums – not the kind of songs you would have heard on the radio…at least not in America. Most of Nick Holmes’ vocals were gritty and growling and the music was dark and brooding. Icon started the slow and eventual evolution that Paradise Lost embodied for nearly two decades. 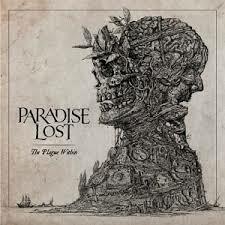 Here is a clip from their debut album, Lost Paradise.